The lunge is a movement used by most strength, power, and fitness athletes to increase leg strength, squatting and pulling abilities, increase unilateral performance, and increase injury resilience. The lunge has a wide array of variations that can be programmed to fit the specific needs of an athlete and further increase strength, hypertrophy, and sports performance. Lunges are a unilateral leg training exercise that can build strength, address movement and muscle imbalances, and enhance bilateral squatting, deadliting, and athletic movements. Strength, power, and fitness athletes can integrate lunges into programs in numerous of ways (see last section below). Powerlifters, strongman, and weightlifters can select lunges as part of a mass building phase to adding training volume or as a strength movement to swap out with lunges to decreased overall loading to the body yet still challenge the lower body. For general fitness and everyday athletes, lunges can help with movement, coordination, and unilateral strength; all of which are important in actions like walking, running, jumping, and bilateral leg training (squats, deadlifts, jumps, etc). Below are ten (10) lunge variations that can be used (and should be) by strength, power, and fitness athletes looking to build serious leg strength and muscle mass. The reverse lunge is done by having an athlete simply step one leg backwards into a kneeling position. In doing so, the athlete can better eccentrically load the hamstrings and glutes, while still loading the quads similar to most lunges. The walking lunge is a dynamic unilateral lower body exercise that has a broad application across most strength, power, fitness, and lifestyle training. The walking lunge can be performed using most forms of resistance (barbell, dumbbell, etc) and done with various loading placements as well to diversify one’s fitness, movement, and abilities. The stationary lunge, also called the split squat, is a basic lunge variation that is done without dynamic movement (as opposed to the walking lunge or stepping lunge variations). This can be useful for athletes who may struggle with balance and coordination, and is often the first variation done with lifters prior to more advanced variations such as Bulgarian split squats and walking lunges. The Bulgarian split squat is a stationary lunge done with the back foot elevated, which increased the amount of loading placed in the front leg. This exercise is one of the premiere unilateral strength and balance exercises done in powerlifting, Olympic weighting, and functional fitness. This variation, unlike most other lunges, forces the lifter to not only place higher amount of their bodyweight on the lead leg, but also use the front leg exclusively to stand up. Front foot elevated reverse lunges are done similar to a reverse lunge, with the only difference is that the lifter steps backward off a plate or small box, which increases the amount of knee flexion in the front leg as they step back. This can help to further isolate the quadriceps (of the front leg) due to the greater knee flexion. The forward lunge is the opposite of the reverse lunge, as the lifter steps forwards and then steps back to the start position. By stepping forward, you for the lifter to eccentrically control the load as the step forward, which can increase quadriceps strength and hypertrophy. The lateral lunge is done by the lifter stepping lateral (to the side) so that the other leg is fully extended. 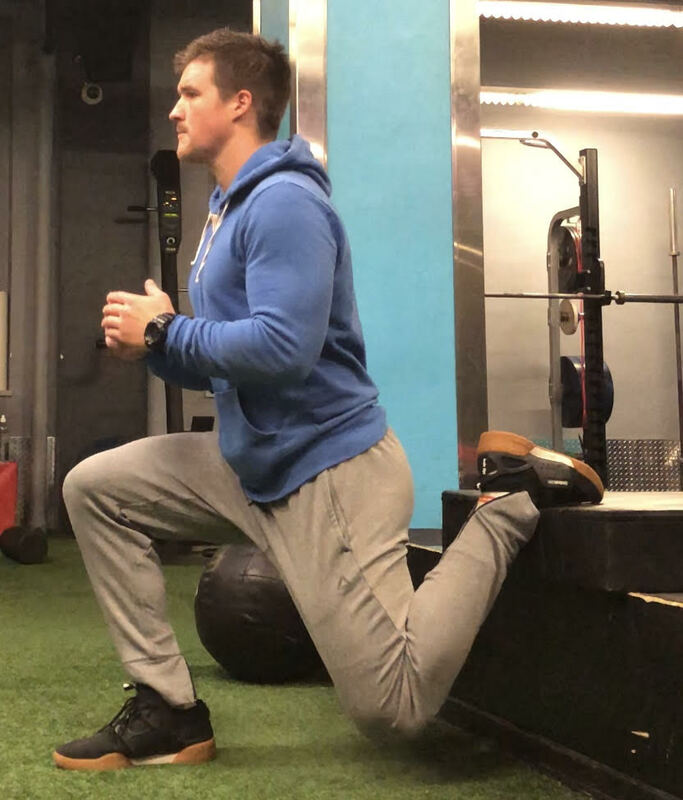 The lateral lunge can be done to increase lateral quadriceps development, increase knee stability, and be used as a lunge variation to help lifters and athletes become more injury resilient to directional changes (in sport or life). Lastly, this can be used to increase hip function which can further enhance squat and lower body performance. The front rack Bulgarian split squat is a Bulgarian split squat performed with the barbell in the front rack (same as the front squat) position. This is an extremely taxing and challenging lunge variation that can increase quadriceps development, unilateral leg strength, and reinforce an upright torso positioning for squatting. The jump lunge can often be applied to the stationary lunge, reverse lunge, and sometimes the Bulgarian split squat. This are a plyometric lunge variation is often done with bodyweight of very little load to increase unilateral leg power. Tempo training can be done with nearly every exercise on this list, even tempo eccentrics in the jump lunge. Tempo lunges can increase time under tension (muscle development), unilateral leg strength, balance, and overall unilateral lunge performance. 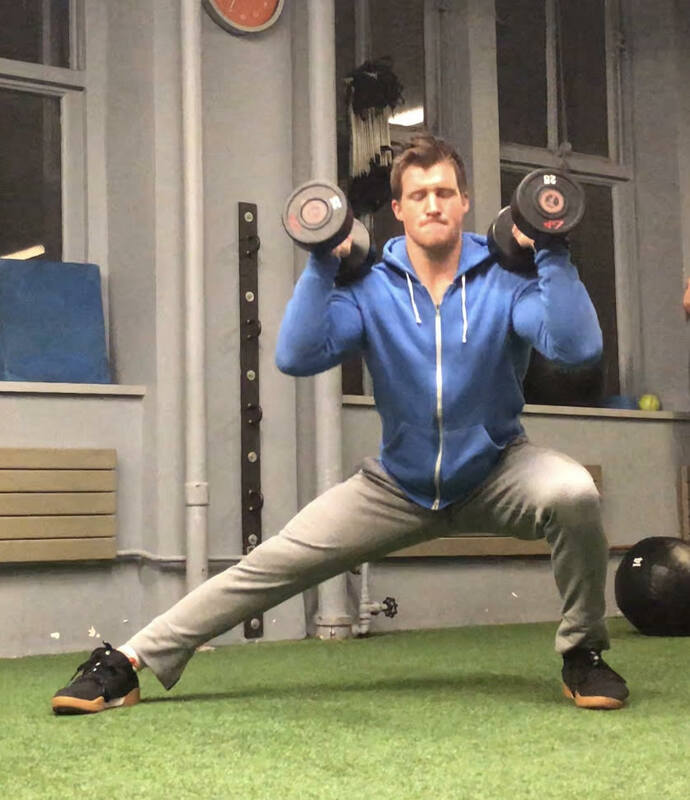 Below are three (3) tips on how you can start integrating lunges into your current workout program to build unilateral leg strength, increase leg hypertrophy, and improve hip and knee function. Adding lunges to a warm-up is one of the easiest way to introduce new movements and prime bilateral exercises (such as back squats and deadlifts). By using the lunge in a warm-up routine, you can stimulate new muscle fibers, improve coordination and balance, and isolate muscles needed for that session’s harder work. 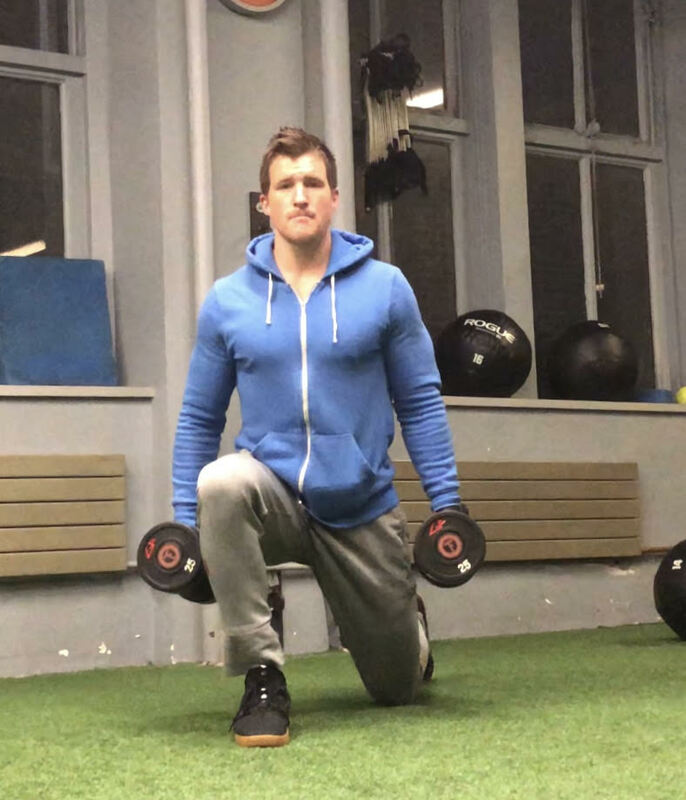 In addition, this is a low-volume way to build up unilateral strength and balance so that you can progress using lunges in a more strength and hypertrophy-based program. Swapping lunges for squats, especially during strength blocks, can be a good way to vary up training stimulus, increase hip and knee stability, and build serous strength and hypertrophy without running the risk of neural fatigue and/or nagging overuse injuries. Lifters who experience pain or nagging issues squatting multiple times per week could take few weeks to swap out one of those days for a lunge variation, which often can help increase stability, muscle development, and movement patterning specific to the bilateral squat. Unilateral training has been shown to increase muscle hypertrophy, due to increase muscle activation and often time under tension (balance and stability may increase time duration). Lunges can be done after main strength and power blocks to add quality loading to the quadriceps, gluteals, and hamstrings without having to load the spine and fatigue the central nervous system (due to unilateral exercises often not having to be done with nearly as much loading as bilateral movements).